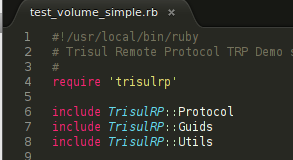 This short step by step tutorial explains how you can get a ruby script running and exchange a simple HelloMessage with the Trisul server. Google protocol buffers on which TRP is built The trp.proto file - if you want to write clients in any language supported by protocol buffers The trisulrp ruby gem project on Github. Pulls welcome! Print HTTP URLs seen by Trisul over a recent time interval. This is a step-by-step tutorial that also explains how to work with IPs and hostnames. View top 100 flows for an IP in a time window.